Scientists developed a new method which allows to estimate the magnetic field of a distant exoplanet, i.e., a planet, which is located outside the Solar system and orbits a different star. Moreover, they managed to estimate the value of the magnetic moment of the planet HD 209458b.The group of scientists including one of the researchers of the Lomonosov State University published their article in the Science magazine. In the two decades which passed since the discovery of the first planet outside the Solar system, astronomers have made a great progress in the study of these objects. While 20 years ago a big event was even the discovery of a new planet, nowadays astronomers are able to consider their moons, atmosphere and climate and other characteristics similar to the ones of the planets in the Solar system. One of the important properties of both solid and gaseous planets is their possible magnetic field and its magnitude. On the Earth it protects all the living creatures from the dangerous cosmic rays and helps animals to navigate in space. 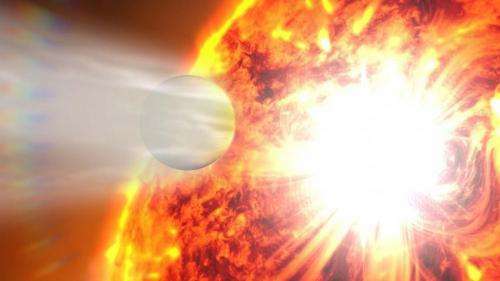 Kristina Kislyakova of the Space Research Institute of the Austrian Academy of Sciences in Graz together with an international group of physicists for the first time ever was able to estimate the value of the magnetic moment and the shape of the magnetosphere of the exoplanet HD 209458b. Maxim Khodachenko, a researcher at the Department of Radiation and computational methods of the Skobeltsyn Institute of Nuclear Physics of the Lomonosov Moscow State University, is also one of the authors of the article. He also works at the Space Research Institute of the Austrian Academy of Sciences. Scientists used the observations of the Hubble Space Telescope of the HD 209458b in the hydrogen Lyman-alpha line at the time of transit, when the planet crosses the stellar disc as seen from the Earth. At first, the scientists studied the absorption of the star radiation by the atmosphere of the planet. Afterwards they were able to estimate the shape of the gas cloud surrounding the hot Jupiter, and, based on these results, the size and the configuration of the magnetosphere. "We modeled the formation of the cloud of hot hydrogen around the planet and showed that only one configuration, which corresponds to specific values of the magnetic moment and the parameters of the stellar wind, allowed us to reproduce the observations" - explained Kristina Kislyakova. To make the model more accurate, scientists accounted for many factors that define the interaction between the stellar wind and the atmosphere of the planet: so-called charge exchange between the stellar wind and the neutral atmospheric particles and their ionization, gravitational effects, pressure, radiation acceleration, and the spectral line broadening. At present, scientists believe that the size of the atomic hydrogen envelope is defined by the interaction between the gas outflows from the planet and the incoming stellar wind protons. Similarly to the Earth, the interaction of the atmosphere with the stellar wind occurs above the magnetosphere. By knowing the parameters of an atomic hydrogen cloud, one can estimate the size of the magnetosphere by means of a specific model. Since direct measurements of the magnetic field of exoplanets are currently impossible, the indirect methods are broadly used, for example, using the radio observations. There exist a number of attempts to detect the radio emission from the planet HD 209458b. However, because of the large distances the attempts to detect the radio emission from exoplanets have yet been unsuccessful. "The planet's magnetosphere was relatively small beeing only 2.9 planetary radii corresponding to a magnetic moment of only 10% of the magnetic moment of Jupiter"—explained Kislyakova, a graduate of the Lobachevsky State University of Nizhny Novgorod. According to her, it is consistent with the estimates of the effectiveness of the planetary dynamo for this planet. "This method can be used for every planet, including Earth-like planets, if there exist an extended high energetic hydrogen envelope around them" - summarized Maxim Khodachenko. "On the Earth it protects all the living creatures from the dangerous cosmic rays". It helps protect, it isn't a major factor. - The atmosphere is the remaining blocker of the primary rays. [http://en.wikiped...mic_rays].